Descend into the sinister depths of madness with MEMORIES, a fascinating sci-fi sound collection that genuinely brings a unique perspective in the indie science fiction framework. 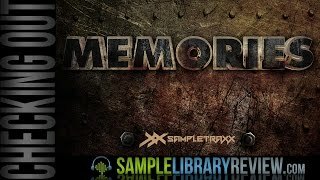 If you are looking for big bold sci-fi futuristic sound design, MEMORIES can add a terrific touch of horror and tension to the darkest sci-fi installment for theatrical audience. Featuring 280+ organic samples with embedded metadata and 10 categories from genre bender impact and hits, sinister tonal material, dark stingers, intricate glitched atmospheres and designed metal textures. Kontakt Instruments are based on Photosynthesis an open source engine made by Jeremiah Pena from exoticstates.com. You can easily access filters, 13 effects, a rhythm section featuring a step sequencer, filter sequencer, 2 filter LFOs, and gain/pan/pitch LFOs. The samples can be used as regular .WAV files, but the Kontakt Instruments require the full version of Kontakt 5 (not included). Categories: Horror, Hum, Buzz & Glitches, Sci-Fi.